In the heart of Texas, there is a unique event taking place that is going to change the world. This amazing event is Dallas Startup Week, and POWERHANDZ is honored to partake in this game changer. The POWERHANDZ family will be in attendance and for good reason. In 2014, when we launched our first patented Anti-Grip Basketball Gloves, we were shipping out of our garage and now in 2019, we are shipping to over 81 countries and have grown so much as a company and as entrepreneurs. We are on the path to impacting thousands of lives in the world of athletic training, rehabilitation, and technology. The more we can accomplish as a business, the more we can change the world for the better. The official brand of the DSW is “Leaders of Innovation” and we are honored to be among driven people that live and breath this motto. This is going to be an AMAZING event. Not only will 10,000 entrepreneurs and startups be gathering to network and improve their business. This isn’t just a week-long convention, this is an investment in your business and future. HUGE guests will also be making appearances. Major businessmen and women such as Mark Cuban, Morgan DeBaun, and Suzy Batiz will be speaking and meeting the guests. 150 sessions will be held highlighting growing your business, investing, networking, nearly everything a young business needs to know to become a success. Our very own CEO, Danyel Surrency Jones, will be speaking on the sports panel at the event. She will be speaking on Wednesday, April 3rd about securing the financial future of athletes and building a brand. As part of this panel, she will dive into branding opportunities for athletes at all stages of their lives! Nothing is more important to us than making sure everyone that uses our products and technology is reaching their potential. It doesn’t matter if they are training to be the next legendary football star or just to improve themselves in their fitness journey, we want your hard work to be integrated with our technology that has proven results to enhance human performance. We will ALWAYS put athletes and patients first to help them become the best they can be. What matters to POWERHANDZ is that you become better than your best and are on the right path to reaching your goals. We are extremely proud to be part of the official kickoff on of Dallas Startup on WFAA. Check out this clip and give POWERHANDZ a shout out!! We were joined by Alyce Alston, CEO of the DEC Network and our fellow entrepreneurs to show off our products and to give everyone a sneak preview for DSW. We are humbled and honored to be leading the charge and taking steps to reach the next level by being part of Dallas Startup Week and the entrepreneur community. 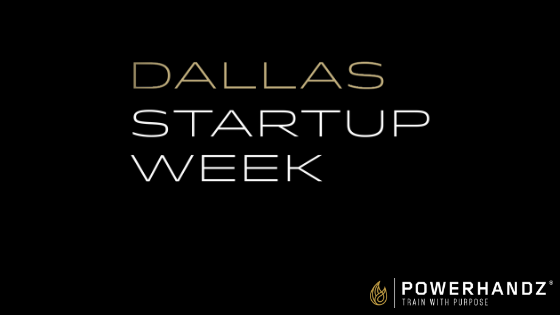 Dallas Startup Week is the ultimate event for entrepreneurs and POWERHANDZ AND our POWER TO GIVE FOUNDATION can’t wait to be on the front row, taking notes. We’ll see you there, fam!